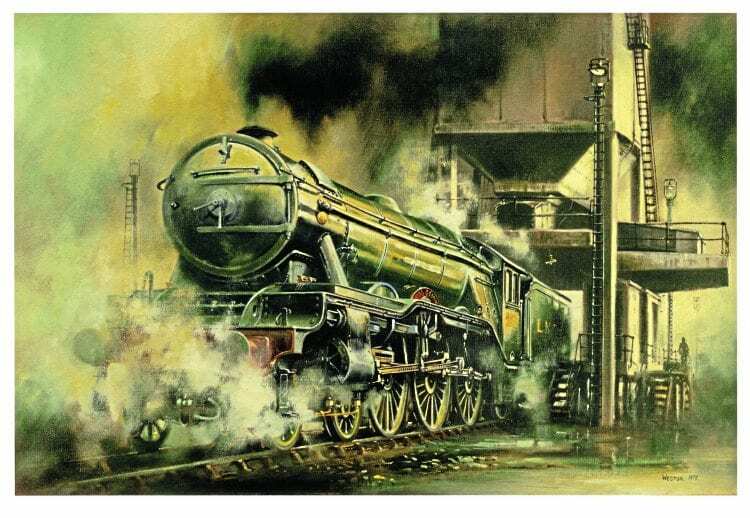 There are many superb images of Flying Scotsman, be they watercolours, photographs or models, but this one is special. Painted in 1975 by renowned artist David Weston, it was presented as a gift to Bruce Lounds, a friend of David’s, and has been kept out of public view for years until now. A stunning painting, it shows the world’s most famous locomotive in all its glory, capturing the raw power, enigmatic beauty and atmospheric surroundings – a scene which simply couldn’t be re-created today. It has been reproduced as a print using top quality paper and inks in a limited print run of 999, and the quality of that reproduction is superb, the image losing none of its impact. The chance to own a Weston original comes along very rarely, and when they do become available, they sell for several thousand pounds each. This print, part of a limited run, is available for £149, including postage and packaging, and would make a welcome addition to many a steam fan’s collection. For full details on how to buy one of the prints, see the advert on page 75 of The RM. Find more Christmas Gift Ideas in the December issue of The RM – on sale now!